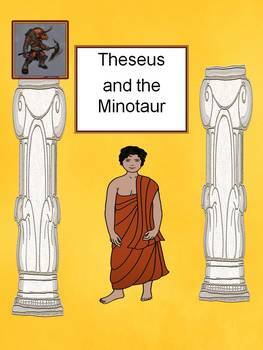 This is a reader's theater play of, "Theseus and The Minotaur." It is funny, and it will keep the attention of your class. The grade level equivalent for the play is 3.4. You could also use this in a special ed. class for students who are at this reading level. The artwork is very sophisticated and was created mostly by the 3 AM Teacher. Common core standards and bloom taxonomy levels are listed. The directions are clear and detailed and include objectives, material list, before class and during class directions. It includes: vocabulary activities, main idea activities, activities comparing the Greek idea of a hero to our idea of a hero, using evidence from the play to judge whether Theseus should or should not be considered a hero, story elements (conflict, climax, etc), sequence of events in the story, etc. Anyway, I think you'll be pleased. It's 48 pages plus directions. Heather Rice- "The Bag Lady"
More products from Heather Rice- "The Bag Lady"